Week 5 in #oldsmooc has been all about prototyping. Now I’ve not quite got to the stage of having a design to prototype so I’ve gone back to some of my earlier thoughts around the potential for Cloudworks to be more useful to learners and show alternative views of community, content and activities. 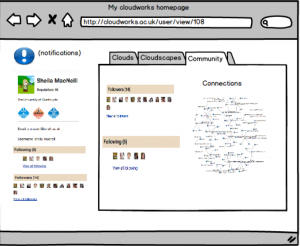 I really think that Cloudworks has potential as a kind of portfolio/personal working space particularly for MOOCs. As I’ve already said, Cloudworks doesn’t have a hierarchical structure, it’s been designed to be more social and flexible so its navigation is somewhat tricky, particularly if you are using it over a longer time frame than say a one or two day workshop. It relies on you as a user to tag and favourite clouds and cloudscapes, but even then when you’re involved in something like a mooc that doesn’t really help you navigate your way around the site. However cloudworks does have an open API and as I’ve demonstrated you can relatively easily produce a mind map view of your clouds which makes it a bit easier to see your “stuff”. And Tony Hirst has shown how using the API you can start to use visualisation techniques to show network veiws of various kinds. In a previous post I created a very rough sketch of how some of Tony’s ideas could be incorporated in to a user’s profile page. As part of the prototyping activity I decide to think a bit more about this and use Balsamiq (one of the tools recommended to us this week) to rough out some ideas in a bit more detail. The main ideas I had were around redesigning the profile page so it was a bit more useful. Notifications would be really useful so you could clearly see if anything had been added to any of your clouds or clouds you follow – a bit like Facebook. Also one thing that does annoy me is the order of the list of my clouds and cloudscapes – it’s alphabetical. But what I really want at the top of the list is either my most recently created or most active cloud. In the screenshot below you can see I have an extra click and scroll to get to my most recent cloud via the clouds list. What I tend to do is a bit of circumnavigation via my oldsmooc cloudscape and hope I have add my clouds it it. I think the profile page could be redesigned to make use of the space a bit more (perhaps lose the cloud stream, because I’m not sure if that is really useful or not as it stands), and have some more useful/useble views of my activity. The three main areas I thought we could start grouping are clouds, cloudscapes (and they are already included) and add a community dimension so you can start to see who you are connecting with. But then I had another go and came up something slightly different. Here is a video where I explain my thinking a bit more. 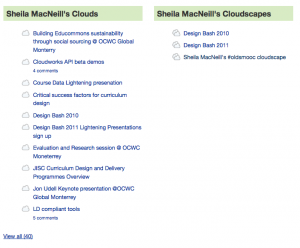 cloudworks profile page prototype take 2 from Sheila MacNeill on Vimeo. and you can see more comments in my cloud for the week as well as take 1 of the video. This all needs a bit more thought – particularly around what is actually feasible in terms of performance and creating “live” visualisations, and indeed about what would actually be most useful. And I’ve already been in conversation with Juliette Culver the original developer of Cloudworks about some of the more straight forward potential changes like the re-ordering of cloud lists. I do think that with a bit more development along these lines Cloudworks could become a very important part of a personal learning environment/portfolio. 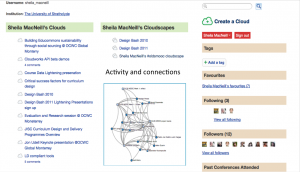 This entry was posted in analytics, curriculum design, data visualisation, e-Portfolio (Technology), elearning, Learning Analytics, learning design, learning platforms, MOOCs and tagged #oldsmooc, #oldsmooc_w5 #MOOCs. Bookmark the permalink. A great piece of prototype thinking in relation to making Cloudworks more navigable and more friendly. I think the Twitter comments, even though they’re a bit frivolous, nicely show that this stuff really matters. It’s how people reach out, connect, build trust and work together. Thanks for taking the time for commenting, and yes that’s exactly why I included the twitter comments:-) so thanks for responding via twitter too.